FILE - Trucks laden with goods headed for Zimbabwe are seen near the Beitbride border post between South Africa and Zimbabwe, in Musina, South Africa, March 28, 2008. The African Union aims to increase intra-African trade by 2022. Handshakes, smiles and jubilation accompanied the long-awaited launch of the African Continental Free Trade Area on Wednesday in Rwanda's capital, Kigali. The trade bloc has been in negotiation since 2012, when the African Union first decided on a continent-wide plan. It aims to create a single market for goods and services, allow free movement of business and investments, and establish a Customs Union to regulate tariffs. As part of a related action plan, the African Union aims to double intra-African trade by 2022. "Africa is one continent that does not trade with itself like the rest of the world," said Erastus Mwencha, former deputy chairperson of the African Union Commission and former secretary general of the Common Market for Eastern and Southern Africa (COMESA). "And, because of that, the huge demographic dividend of the continent is not of any advantage to the continent because Africa has not taken advantage of its market size, which is 1.3 billion people plus a GDP of over 2.3 trillion [U.S. dollars]." 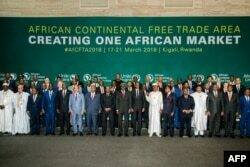 The African Heads of States and Governments pose during an African Union Summit for the agreement to establish the African Continental Free Trade Area in Kigali, Rwanda, March 21, 2018. But the Kigali launch — while significant — is largely symbolic, as many challenges remain before the trade deal can be implemented. Gerrishon Ikiara, associate director of the Institute of Diplomacy and International Studies at the University of Nairobi, notes that Africa faces many political, social and economic barriers to integration. "There is also often a bit of conflict between the French-speaking Africa, the English-speaking Africa, the Maghreb Arab part of Africa in North Africa. 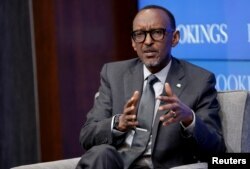 Then you have a few dominant economies like South Africa, Nigeria and small ones like Rwanda," Ikiara said. African trade is dominated by the export of raw materials to Asia and the West, and import of finished goods. One of the reasons is because national markets operate like silos, says Mwencha. "If you look at some of the economies in Africa with a population of half a million people, a population of three million people, a population of five million people — with very little purchasing power. You cannot be able to really advance economically. And so, you require a bigger market," he said. The African Union says reducing barriers to trade within the continent will boost manufacturing and value-added products and services. Chairperson of the African Union — and president of Rwanda — Paul Kagame noted in his keynote address at the summit Tuesday that less than 20 percent of Africa's trade is internal, compared to three times that in other trade blocs like the European Union. FILE - Rwandan President Paul Kagame speaks about "Flagship Reforms for a More Effective African Union," at the Brookings Institution in Washington, Sept. 21, 2017. Part of the problem is that incentives for trade are skewed toward off-continent partners. Mwencha says intra-African tariffs average 12 percent, while Africa charges the rest of the world about 8 percent. "So, that is a misnomer that … charity begins at home," Mwencha said. "I mean, we're not giving each other advantage. And, because of that, the cost of doing business on the continent, whether it is trade facilitation, is also very high. So this is, to me, a significant movement." But just days before the launch, Nigeria — Africa's largest economy — announced President Muhammadu Buhari would not attend. A government statement said key stakeholders, a reference to the business community and trade unions, had not been consulted about their concerns on the treaty. Some economists warn that without Nigeria's participation, the African CFTA will be severely handicapped. 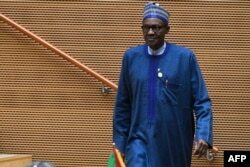 Nigeria's President Muhammadu Buhari is seen after speaking at the opening of the Ordinary Session of the Assembly of Heads of State and Government during the 30th annual African Union summit in Addis Ababa, Jan. 28, 2018. However, national consultations are understandable, says Mwencha. "That is OK," he said. "But one hopes that this doesn't drag, because Nigeria perhaps may take a position that it is a large country, with almost 170 million people, that they can do without [the] continent. That would be an unfortunate position." For the 44 countries who signed on to the deal this week, the next step will be getting their national parliaments to ratify the free trade deal, which could take years. The 10 other countries in the AU would also have to sign on for the deal to be continent-wide. Regional integration could be a bigger challenge for Africa than it was Europe. But while the EU took more than half a century to establish itself with 28 members, economists such as Ikiara expect it will take years — not decades — for Africa. "Right now, also we're having improvements in terms of infrastructure," Ikiara said. "Ports which are connected with each other, railways and roads which are interconnecting in more African countries. And I think that connectivity, I see it as being a major push. Because, once the … interconnectivity is improved, the private sector becomes even more effective." Despite the challenges ahead, the trade bloc's launch Wednesday is another step by African nations toward closer integration.